President of Ireland, Michael D Higgins, will lead the State commemoration of the 1913 Lockout on Saturday, 31st August – 100 years to the day of Bloody Sunday 1913. Higgins will lay a wreath at the statue of the ITGWU leader James Larkin on O’Connell Street. The Civil Public & Services Union is also supporting numerous events. Unions have been declining in modern Ireland to a significant degree because they have struggled to gain recognition from employers who are increasingly reluctant to work with them. The ways unions have sought to represent members and the ways employers’ have resisted recognition are, of course, dramatically different from 100 years ago. In place of turbulent and sometimes violent opposition, they now face a more silent process of marginalisation. The Lockout was tangential to the developing storm over whether Home Rule for Ireland would be passed in the face of unionist opposition in Ulster. It occurred at the same time but the two had little to do with each other. 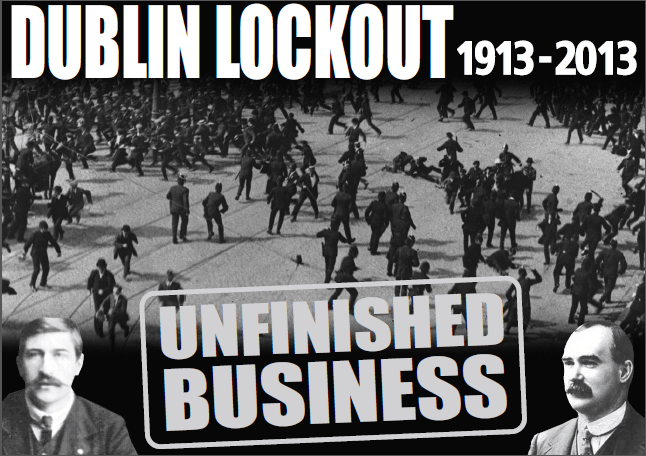 … However, there is an argument to be made that the Lockout played a role in radicalising some republican activists. Finally, those who haven’t read James Plunkett’s novel Strumpet City, which is set during the lockout period, are urged to pick up a copy, put on the kettle and settle in for a great story. Civil Public & Services Union poster for the lockout centennial. This entry was posted in Business & Environment, History, Politics and tagged 1913 lockout, James Larkin, James Plunkett, Strumpet City on August 29, 2013 by admin. As the centennial of the 1913 Dublin strike and lockout nears at the end of August, the capital city is coping with a contemporary work stoppage by Dublin Bus employees. 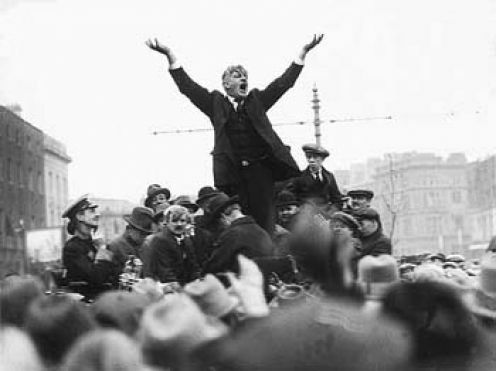 In the summer of 1913, James Larkin [photo below] called a general strike of the employees of the Dublin Tramway Company. It escalated to this point after William Martin Murphy owner of The Irish Independent, The Evening Herald, and of course the trams, banned workers from joining or being a member of Larkin’s union, the Irish Transport and General Workers Union. History would remember Larkin’s decision to go on strike as an impressive and tactical bit of timing on his part, as it coincided with the opening day of the Dublin Horse Show; one of the busiest days for Dublin’s public transport. This led to an agreement between the majority of large business owners in Dublin locking out their workforce, causing riots, civil unrest, and very poor conditions, and lasted nearly six months. Here’s a detailed chronology and background of Dublin’s 1913’s labor unrest, including the city’s deplorable tenement conditions, from University College Cork. Contemporary Dublin Bus workers are to vote over the coming week on proposals to settle their dispute, The Irish Times reports. As I’ve mentioned in previous posts, my grandfather, his brother-in-law and several cousins and friends — all from Kerry — worked as streetcar motormen and conductors in Pittsburgh. They would have participated in numerous strikes against Pittsburgh Railways Co. in the 1910s and 1920s. This entry was posted in Business & Environment, History and tagged 1913, James Larkin on August 10, 2013 by admin.